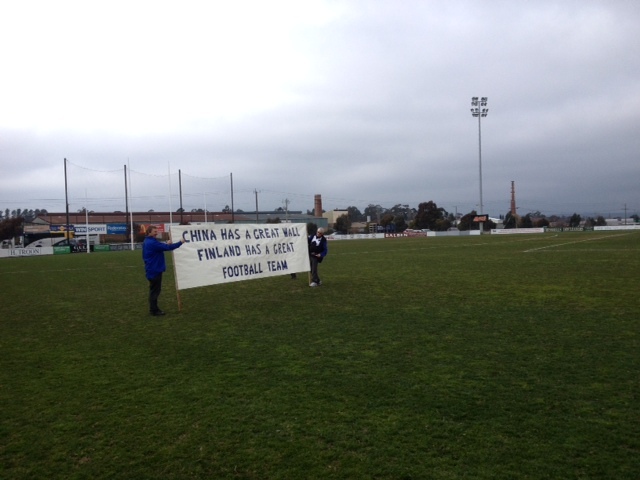 Foggy & windy conditions greeted the Finnish & Chinese teams as their buses arrived at Eureka Stadium, North Ballarat. On paper, This was likely to be a pretty close one, the wide expanses of the oval, combined with the wind, made it seem a certainty. Match began at 11:10, first quarter saw China doing a lot of the attacking, but unable to capitalise, kicking several attempts at goal out of bounds. In fact the ball spent most of its time this quarter in their forward half, with lots of stoppages & crowded packs. It seemed to go by in a flash & a totally scoreless first quarter seemed a surprise. China's Ruckman GaoPeng was starting to take some marks inside 50 & present as a good target. Second quarter, both teams attempted to get some run into space. Finland linking up well for the first goal of the game. China wasting opportunities & perhaps trying to be too 'cute' by hand. China pace was starting to become evident, but Finland were defending very well by getting numbers back for intercepts. A courageous jump into the pack by a Finnish player saw him stretchered off & cause a brief delay in play. This reduced their bench to just three players. In the third quarter China started to get on top, their youth and pace was beginning to show. China's playing coach, Jiaming Pi was stationed at full forward due to a rib injury, but was peppering the goals, kicking four behinds in the 3rd quarter alone. Lampi (#6) of Finland was all over the ground causing a lot of problems for China, kicking Finland's second goal to give them back the lead. However China's tall forward target, Chen Shaoliang, snapped truly from 30m out to give China the lead going into the break. It was a tight and tough last quarter that really could have gone either way. The crowd had grown & started to really get into the match, creating an electric atmosphere. 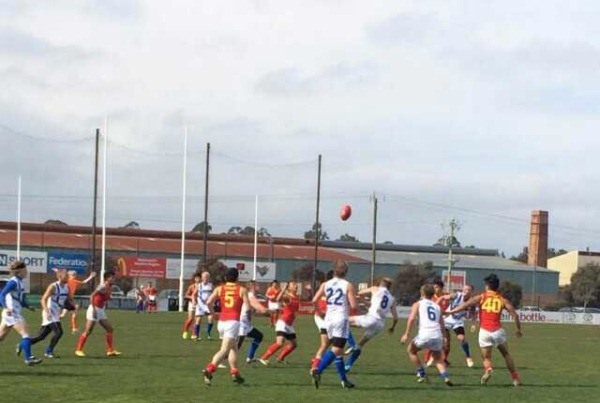 A crucial goal was finally kicked by Jiaming Pi (he ended up kicking 1 goal 5 behinds!) but Finland wouldn't lie down, Lampi kicking another goal and narrowly missing a few others. the final few minutes saw every single player in Finland's forward 50m ark, ultimately they run out of time. 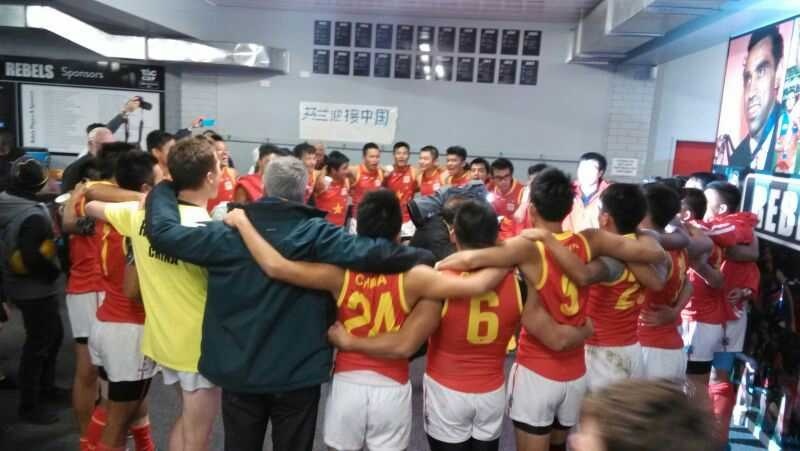 China hung on for a win, their players ecstatic & emotional. 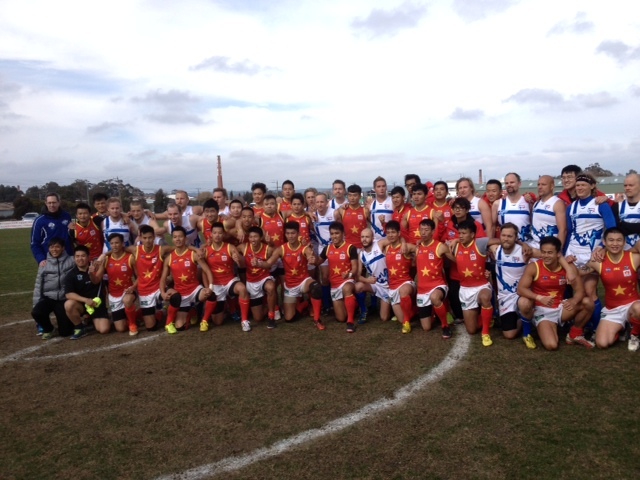 There were great displays of sportsmanship & camaraderie as both teams gathered for handshakes & photos after the game. 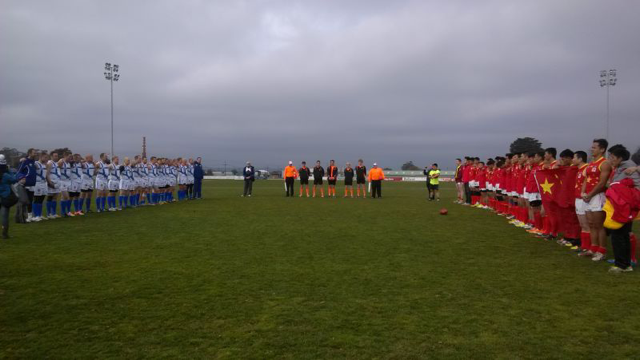 The match was a curtain raiser to North Ballarat v Williamstown VFL match, of which players from both China and Finland stuck around to watch, China giving a lot of vocal support to their Melbourne host club, Williamstown. Footnote: Leonard Walin-Bates sent us some extra news from events surrounding the match The collision that had one of our players stretched off was concussed. Our other player( the finnish captain Mika Kupila) involved in the incident was seriously hurt take to the Ballarat Base Hospital, it was discovered he has two fractures to his right eye socket and other potentially life threatening head injuries he has being transfer to the Royal Melbourne Hospital for more specialized care. He should make full recovery. A foot note here the staff of Ballarat Base Hospital were truly wonderful in the support they gave to Mika! Also i think he's a bit of a chick magnet, its surprising how many nurses you can fit in a cubicle. Also the banner in the Cinese rooms (see pic below) was made by wife a Finnish citizen it reads in Chinese " Finland greets China"